BrightTALK now has over 7+ million professionals who join 75,000 free talks and 1,000+ online summits to discover new ideas, technologies, and insights. For the first time, BrightTALK studied this data across over 1,000 businesses so we can honor marketers that have demonstrated excellence on BrightTALK. 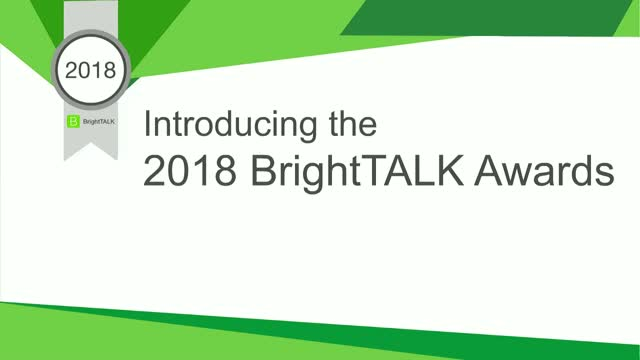 With ten total categories, including Most Prolific Channel, Highest Rated Talk, and Most Successful SMB, the BrightTALK Awards highlight success across BrightTALK's most popular communities: IT, Financial Services, and Line of Business. Join this session to learn more about the data we analyzed, key metrics for Channel and webinar success, and top performers from 2018.